for me one of the most charming tattoos is the bluebird. like many designs, bluebird tattoos have nautical roots - rumor has it that when a sailor traveled 5,000 miles at sea he would get a bluebird tattoo on his chest and when he completed 10,000 miles he would get a second bluebird on the other side. like many nautical designs bluebird tattoos easily transferred to the general public -- i have found that bluebirds are very popular among both women and men. bluebirds have long been regarded as a sign of happiness, prosperity and good health in many different cultural traditions - and it is a bit staggering to consider all the attention, poems, songs and myths that surround this endearing little bird. in today's tattoo cosmology a bluebird is regarded as a symbol of luck. That's a beautiful tatoo mouse, but my thought is that the person who wears it can't see it on her back! I thought of you yesterday when I saw a woman with tatoos in a store! If I had had a camera I would have asked her for a picture! I have NEVER heard that Moody Blues song -- and I love the Moodys. I wonder how that one got past me? 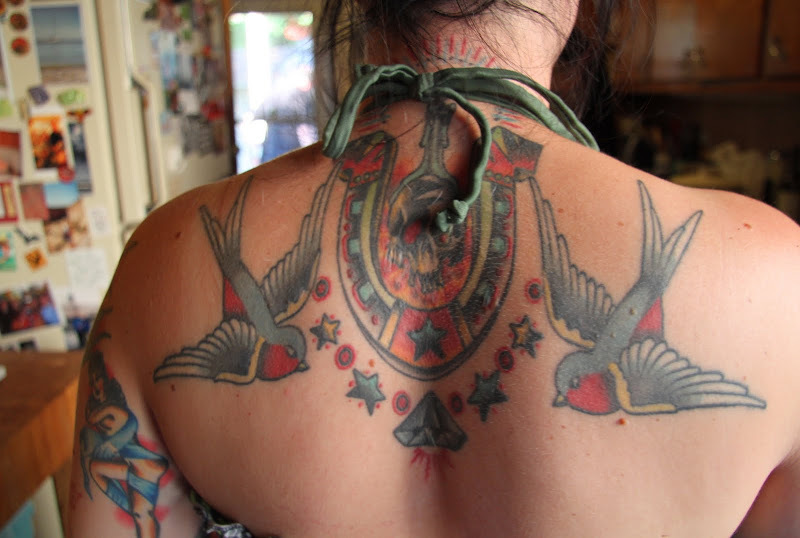 I agree about tattoos -- I'm glad they weren't popular when I was in college, because I'm sure I'd have at least one, and I'd probably eventually regret it!